Home / Game Review / Inspector Gadget / IOS / video games / Inspector Gadget M.A.D. Dash Reveals Dr. Claw's Face! Inspector Gadget M.A.D. Dash Reveals Dr. Claw's Face! Dr. Claw's identity (other than the infamous leader of M.A.D.) was one of the big mysteries of '80s cartoons. But thanks to the M.A.D. Dash game for iOS, you can finally see what he looks like! Wowzers, check out the trailer!! The game is produced by XMG studios with an endless runner format with you taking control of the famous detective and numerous gadgets. As you avoid Dr. Claw's traps, collect Gadget coins to unlock bonus content which includes the aforementioned Dr. Claw picture. "Go Go Gadget" ringtone and sound, and 10 full episodes of the Inspector Gadget cartoon! Go Go Gadget Run! Everyone’s favorite bumbling detective, Inspector Gadget, finds his way into a new fast-paced adventure where the Inspector uses his collection of gadgets to chase down Dr. Claw and his henchmen and save his niece Penny. * Game Center integration so you can challenge your friends and see who gets the highest score! * Unlock and unscramble an image to reveal the elusive Dr. Claw’s face! 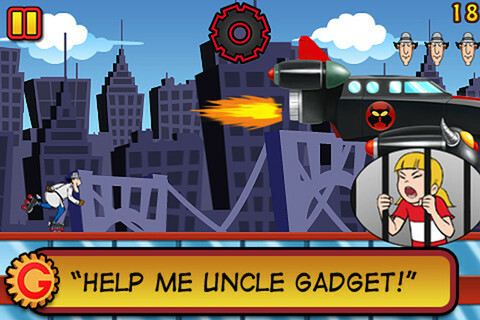 The game is available for $.99 cents with the option of purchasing Gadget coin packages. It current holds a 4.5 star rating for its current version with a lifetime rating of 4 stars. Check it out in the iTunes store! The face shown in the app is the same as the face on the Dr Claw toy from 1983. Didn't remember they had released that! Nice work.